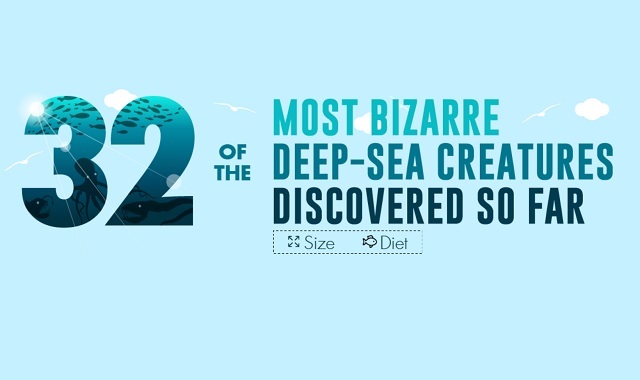 32 of the Most Bizarre Deep-Sea Creatures Discovered So Far #infographic ~ Visualistan '+g+"
The ocean covers 70% of the Earth’s surface and has incredible depths that reach over 36,00 feet. With so much area to cover, explorers haven’t been able to discover every single organism that lives within its watery depths. Although the ones they have come across have proven to be, well, bizarre. This infographic from AlansFactoryOutlet takes us on a ride down to the deepest parts of the ocean to explore the almost-cartoon like creatures that lurk in its darkness. On the ride down you’ll discover the Giant Oarfish that is in Japanese folklore as a harbinger of earthquakes; as well as the Flying Spaghetti Monster, which was once believed to be a myth. Watch out for the 46 foot Colossal Squid and its long tentacles that have sharp hooks on their ends. You’ll also come across the deepest-diving mammal, the Cuvier’s Beaked Whale, which is known to frequent depths of almost 10,000 feet. Enjoy your swim through this bizarre and informative infographic, and be careful of those tentacle hooks!